Dry ice is a multifaceted, outstanding cooling medium with fascinating physical properties. Dry ice does not dew into water, but sublimes into the gaseous state. Its cold of -78.48 degrees comes close to the Antarctic low records. Often the temperatures fall far below -60 degrees, the lowest ever recorded cold record is -93.2 degrees, measured by a satellite on a high plateau in the East Antarctic. These properties contribute to the fact that dry ice in the form of pellets is an ideal blasting medium. A high level of purity without secondary blasting agent residues. These properties are used by the industry to clean sensitive tools and equipment with the so-called dry ice blasting process. 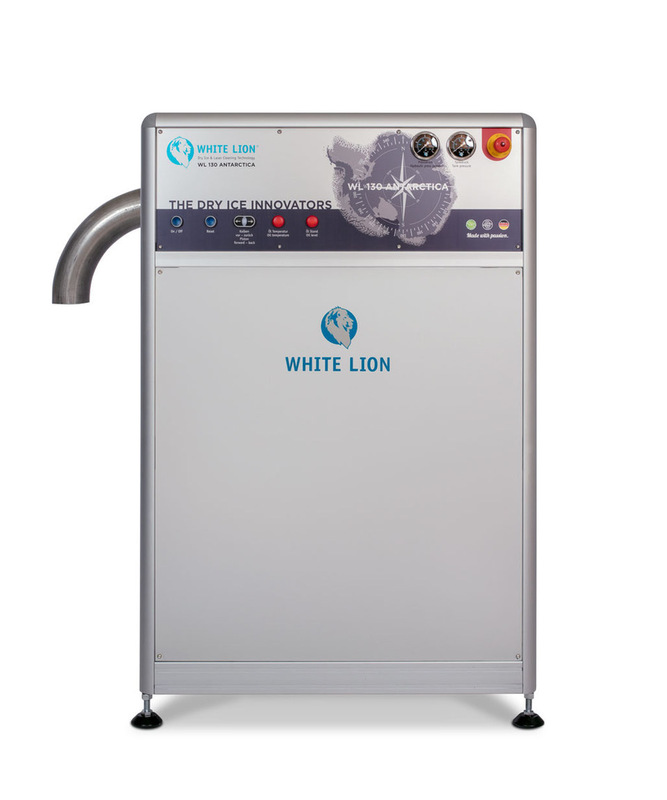 The machine “White Lion Antarctica 130” is a press for the production of dry ice pellets. With different dies the size of the pellets can be varied between 3, 10 and 16 mm. The output is ca. 120 kg/h with pellets with a width of 3 mm. The production output of the “White Lion Antarctica 260” is approx. 260 kg / h with pellets of 3mm size. By changing the matrix, the pellet size can be varied between 3, 10 and 16 mm. In practice, the production of dry ice takes place through the decompression of liquid CO2 from a suitable tank with a pressure of about 17 bar to atmospheric pressure. In this process, the liquefied CO2 is injected into a mould or antechamber. The dry ice snow produced in this manner is then pressed with a hydraulic press into dry ice in the form of pellets or blocks of different dimensions. The CO2 gas produced during the manufacture of dry ice can be again liquefied with a CO2 recovery system if necessary. If you need dry ice in large quantities in the short term or on a regular basis, having the ability to produce your own dry ice makes sense. 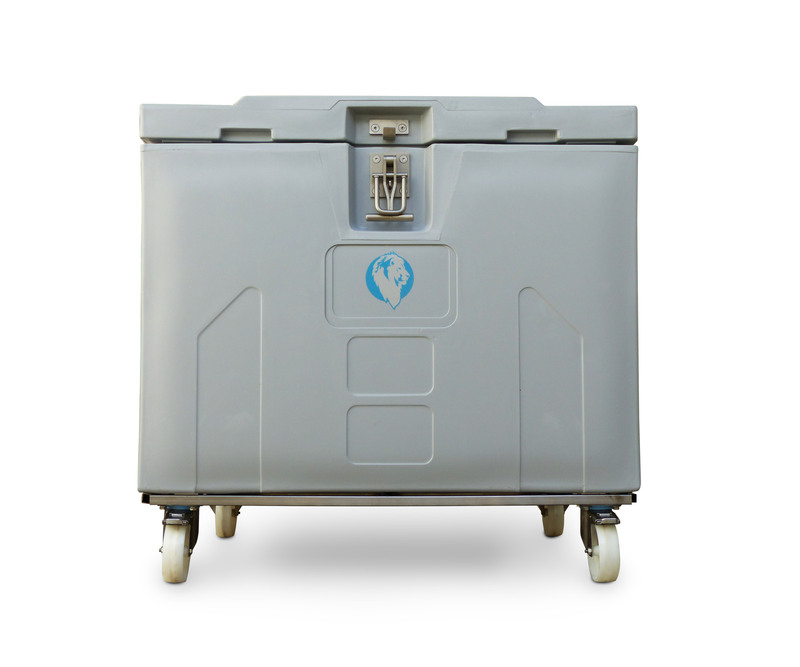 With your own dry ice machine, you can ensure the supply of high-quality dry ice – at the right time, in the right place, and in amount you need. The transportation of dry ice over long distances inevitably leads to sublimation losses. During storage and transport, dry ice not only loses weight, its quality also progressively deteriorates as a result of condensation from ambient humidity and icing of the surface. By contrast, liquid CO2 for on-site production can be stored without loss. For certain dry ice applications, such as for example dry ice blasting, the quality of the dry ice to a large extent determines the success of the application. With our high-quality White Lion dry ice transport boxes you can transport your dry ice safely and outstandingly isolated. Learn more here.